Did you ever wonder just what happened to our heroes after the credits rolled and The Return Of The Jedi was over? Yes, yes, I know, they foiled an invasion by the Ssi-Ruuk. But that was the alternate universe of the Legends canon. I’m talking the new, rebooted canon leading up to Disney’s triumphant (we hope) entrance into the franchise. Well, wonder no more! 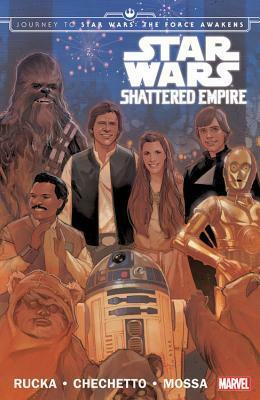 Marvel has brought us Shattered Empire to answer some of those questions and help set the board for Star Wars–Episode VII: The Force Awakens. Now, I know this is a four-issue miniseries, but I want you to try something. Instead of thinking of it as a unified story, think of it as a themed anthology, a collection of shorter tales all featuring the same main character with numerous side characters along for the ride and all loosely tied together by a common end goal. If you can do that, this earns the four stars I took the liberty of giving it–possibly even a fifth. If you can’t, if you go into this expecting a single unified story, that rating probably seems incredibly generous as the episodic plot rambles all over the place and sprawls out over a three-month period with sometimes little connective tissue between adventures. So please, go into this book with the proper expectations, because it really is worth the read. Our story opens during the climactic moments of The Return Of The Jedi. While Luke engages his father in an epic lightsaber battle and Han’s commandos prepare to destroy the shield generator protecting the second Death Star, the Rebel fleet battles for survival between the Imperial Navy’s hammer and the Death Star’s anvil (or is that the other way around? Doesn’t matter, moving on.) Our protagonist, Shara Bey, is an A-Wing pilot caught in that battle, while her husband Kes Dameron is with Solo’s strike team on the surface. Following the battle, they get a brief respite during the victory celebration, but then it’s once more into the breach as comm traffic reveals a holdout Imperial base on the far side of the planet. Striking that base reveals a sobering fact: the war is far from over. The Emperor had a slew of contingency plans, and the Imperials control the airwaves. Palpatine may be dead, but most of the galaxy doesn’t know that. We then jump to several weeks later, as the Rebels work hard to liberate world after world. Off the front lines on light duty after her fighter is disabled, Shara accompanies Princess Leia to Naboo on a diplomatic mission to gain allies for the fledgling New Republic. Unfortunately, as the Emperor’s homeworld, Naboo is one of the prime targets of Operation Cinder, the Emperor’s program of vengeance from beyond the grave….Meanwhile, Solo’s strike team takes on an Imperial Security Bureau black site. Finally, we jump again to about three months post-Endor, as the grave reality is finally settling in for everyone involved–despite their recent victories, there is no end in sight for the ongoing war. Struggling with the question of whether or not to muster out and settle down with her husband and son, Shara joins Luke Skywalker on an undercover mission to recover an artifact of the old Jedi Order. Like I said, if you come into this with the proper expectations, it’s solid gold. The writing is top-notch, and the art is incredible. In the middle the series gains a couple backup artists, I assume to help with backgrounds and such given the compressed publication schedule (the whole thing was published over the course of a month and a half), but it was surprisingly not an issue. The whole book is full of delightful blink-and-you’ll-miss-it gems, such as a sly, almost imperceptible reference to the fan theory that the Ewoks were serving roast Stormtrooper at their celebration party, a brief exhibition of Leia’s fledgling Force sensitivity as she feels “cold” when crossing paths with Maul’s imprint, and another semi-appearance of Commander Beck from Han Solo’s Smuggler’s Run (also by Greg Rucka, now that I think of it.) The ties to The Force Awakens range from the obvious (Poe Dameron is the son of Shara and Kes) to the more foundational, such as the war not ending where we all assumed it did. Bottom line: Find this, read it, and enjoy it. Just know what you’re in for.